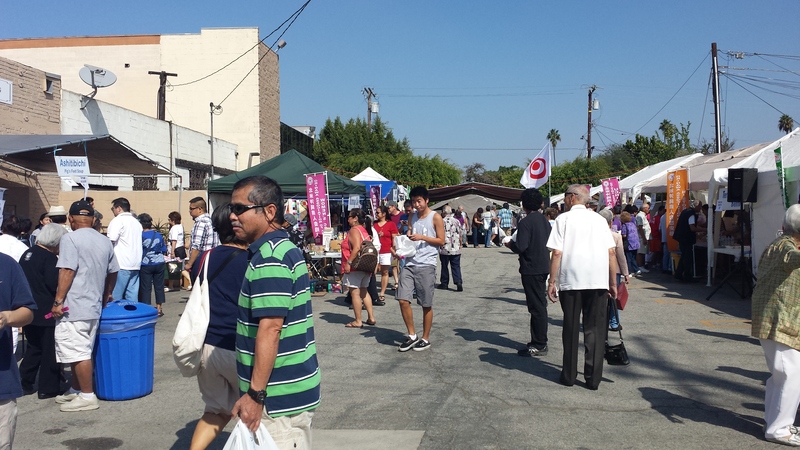 Yesterday I was able to take James with me to the Okinawa Association of America’s Annual Bazaar in Gardena, CA. The vendors and performance stage were in the parking lot. 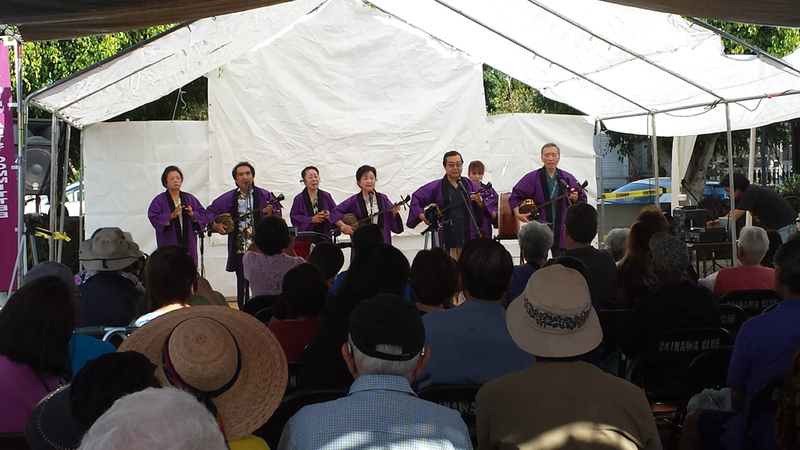 The dining room, which served soba, was also open to the festival goers. 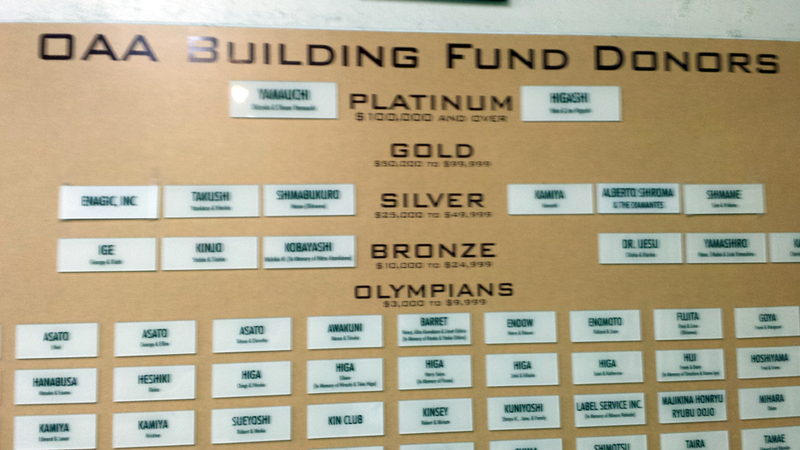 The photos below are of the dining room where they had a donor plaque on the wall, and I saw a “Masao Shimabukuro” from Okinawa as one of the more prominent names. I know it’s a very common last name, but I wonder if we are related somehow? Dining area, serving Okinawan soba. The photos below are of the performances. They had the stage set up at one end of the lot so you could easily browse the vendors, pick up a snack, and make your way over to watch the entertainment. 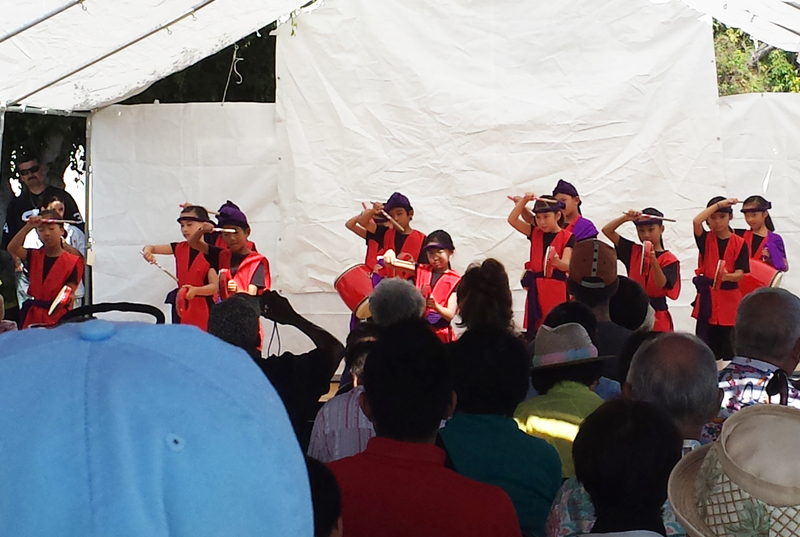 The eisa performance was put on by an elementary school with a Japanese language immersion program. It was really cute. To introduce their performance, a little girl first gave the intro in Japanese. She was an expert and spoke way too fast for me to pick up any of the words. LOL! Then a little boy repeated it in English. It was also really funny to watch the little kids drumming and doing their “moves” – some had great rhythm, others not so much. 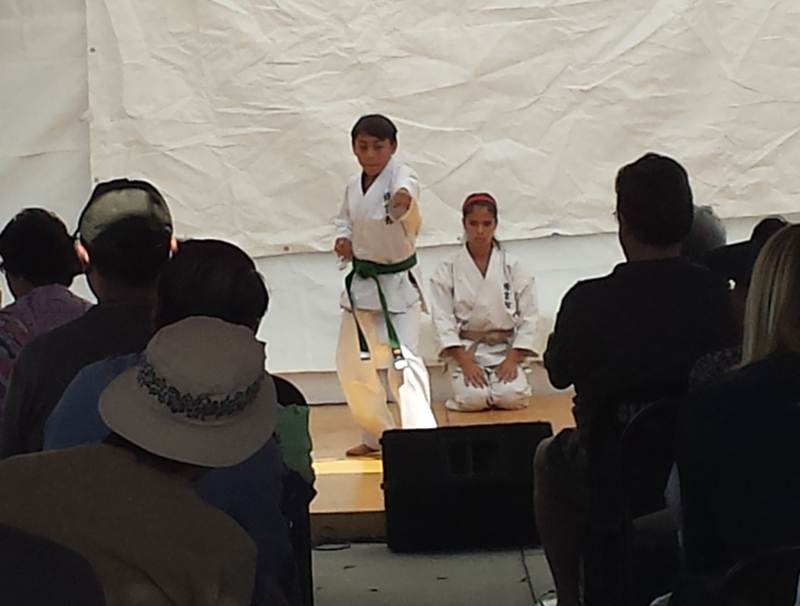 The karate demonstration was a small group of four kids from a local club, and I think the minyo performance was part of the Okinawa Association of America, but I’m not sure. The performance area was covered by large tents with plenty of shaded seating, but most of it was saved (and unoccupied!) 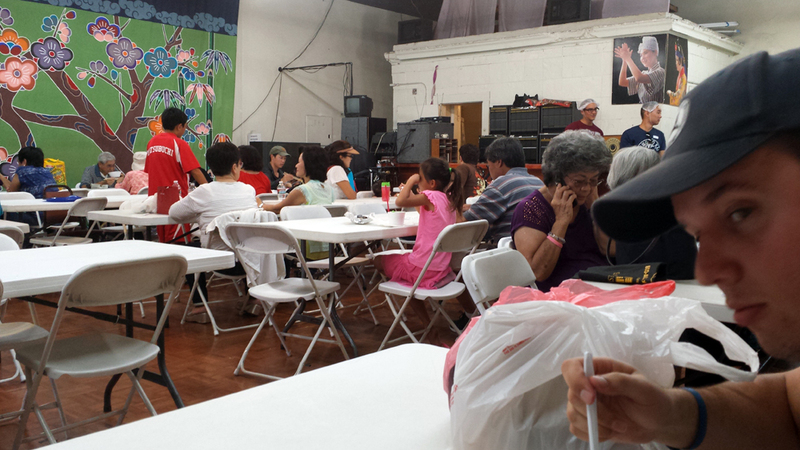 so we stood in the back and watched a few performances while we ate shaved ice, manapua, and iced coffee. The pictures below show the setup of the festival and some of the vendors that were there. There were two things I had never heard of – kasa muchi (the sign said it was Okinawan mochi, but I didn’t find any information via Google) and ashitibichi (pig’s feet soup) but they sold out immediately so I couldn’t try it. 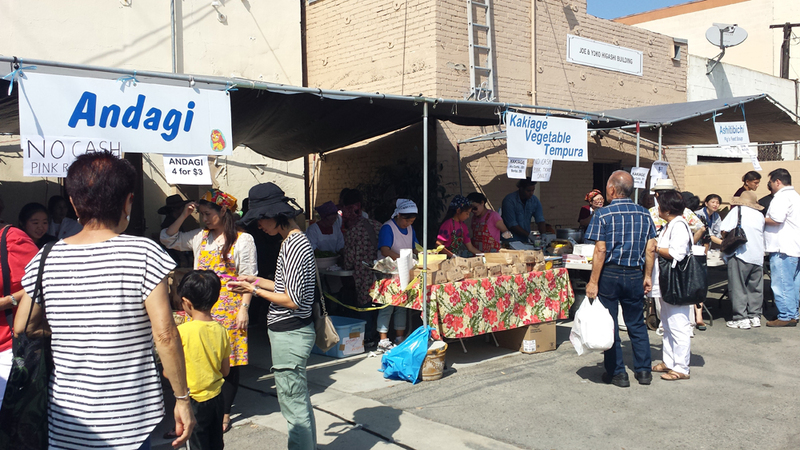 My first stop, of course, was the andagi booth. It was so good but not nearly as yummy as Grandma’s. Although it was hot and we were sweating like crazy, I made James take a selfie with me as he tried his first andagi, which I tried to describe as the Okinawan version of a donut which is amazing, denser, and not as sweet. 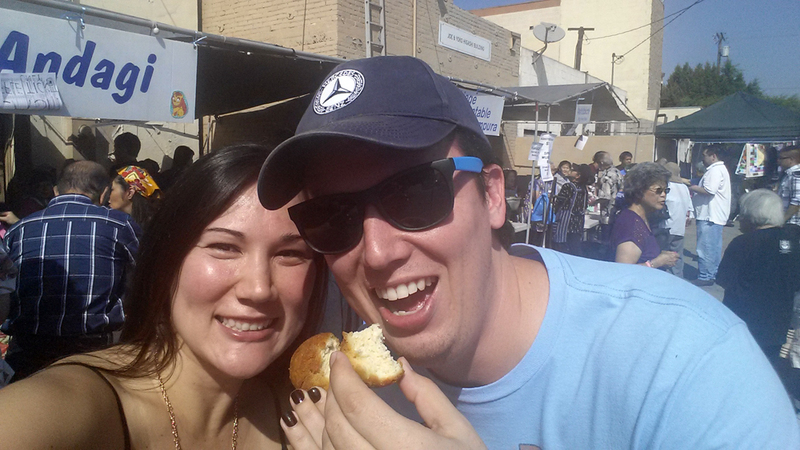 I made James take a selfie with me as he tried his first andagi. We arrived about 15 minutes after the festival opened at 11am and it was packed! While we were there, the crowd thinned out (see the festival crowd photo below) but was picking up again when we left around 1pm. Our timing was good though because we never had a long wait in any of the lines. 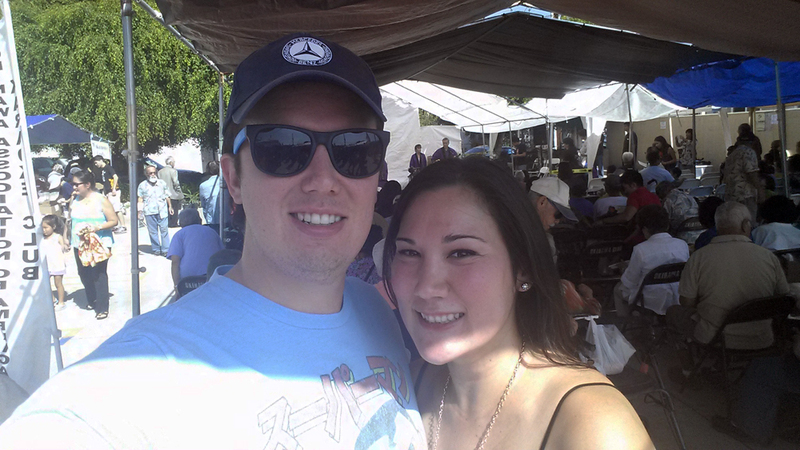 In addition to the andagi, we also ate manapua, mochi, shaved ice, soba, butter mochi, iced coffee, and spam musubi. I felt like I accomplished a lot there. LOL! Festival Crowd. High-res photo — click to enlarge. 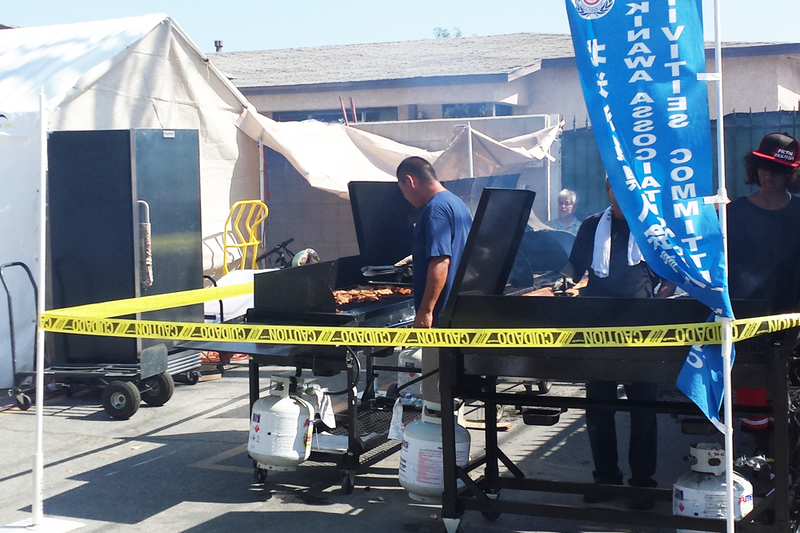 The photo below is of the barbeque area where some very dedicated volunteers (it was ridiculously hot) were grilling the meat for teriyaki chicken bentos. I started out the day hungry and planned to get one, but by the time I had eaten all the items that I had deemed harder to find in LA, I was too stuffed! I’ll have to make a trip to L&L — surprisingly there are several locations as well as other “Hawaiian BBQ” spots throughout LA — for that craving soon. And last is the obligatory “normal” photo of me and James. Poor guy, I’m always making him smile for the camera to try to capture our outings together. Overall, it was a really fun bazaar. Editor’s note: Elizabeth is a Kaimuki High School and Pepperdine University grad and an HR Administrator with Target, in Pasadena, and James Durrough, Elizabeth’s boyfriend, is an Allstate insurance agent.